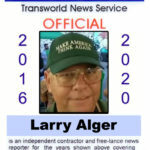 Home JNN Editorial JNN reports Hennepin County MN in North Dakota 10-28-16 WTF? JNN reports Hennepin County MN in North Dakota 10-28-16 WTF? We at Justice News Network are closely following the stories from North Dakota. We are witnessing the war being waged by the Army that Governor Jack Dalrymple (Call Him and tell him what YOU think, OK? 701-328-2200) has assembled to contain the peaceful process of redress the citizens are engaged in questioning the veracity and legality of the Dakota Access Pipeline process. Not the least of the issues is the lack of Environmental Impact Studies and assessments in any of the sates, as well as the Federal Government, involved this project. Thursday, police in riot gear fired beanbag rounds and pepper spray at Dakota Access Pipeline protesters near Cannonball, North Dakota in an attempt to disperse the crowd. The protesters were gathered on land owned by pipeline developer Energy Transfer Partners. Officers arrested 141 people. The Standing Rock Sioux has been fiercely-opposed to the pipeline, which would run under the Missouri River, just upstream from the reservation. The standoff at the Standing Rock Sioux Reservation began in August after construction began on the nearly 1,200-mile pipeline designed to transport crude oil from North Dakota to Illinois. Indigenous peoples call the project a threat to their access to clean water and an insult to their forefathers, some of whom are buried in the pipeline’s path. 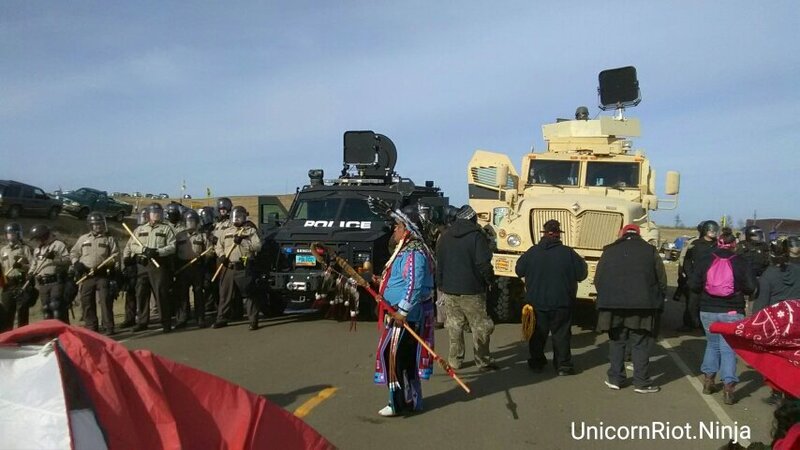 Friday, protesters in North Dakota accused state and local authorities of jamming cellular network coverage. Morton County sheriff’s spokesman Rob Keller said authorities did not jam cell phones this week, and have not jammed cell phones at any time during the 2 1/2 months of protests. HOW can it BE that this project is quite literally being rammed down the throats of ALL Americans with very little oversight, and virtually NO consideration to the treaties and laws that apply to the native Americans being run roughshod over. Does the image of bulldozers and backhoes plowing through Arlington National Cemetery to install a FOREIGN INTEREST oil and gas pipeline site well with you? THAT dear readers is exactly the view our native American relatives have from their front row seats and Dakota Access destroys their sacred grounds and burial sites on the high plains with total impunity. In fact not only does this corporation have impunity, they have the national guard and assets and manpower for SEVEN regional states strong-arming the citizens from ALL OVER America demonstration against these actions. Part of this army is from Hennepin County Minnesota, home of the Twins and Vikings, you know, Minneapolis. THAT is 500 miles away. ONE of our questions is WHY in the hell is a county Sheriff 500 miles away from the Standing Rock Tribe SPENDING their constituent tax payers money by sending his county’s manpower and assets there in the first place? What is the Joint Powers Agreement North Dakota and Minnesota have signed, WHO signed it and WHEN? And does Morton County and Hennepin County have such a written agreement in force and when was THAT SIGNED and by WHO? 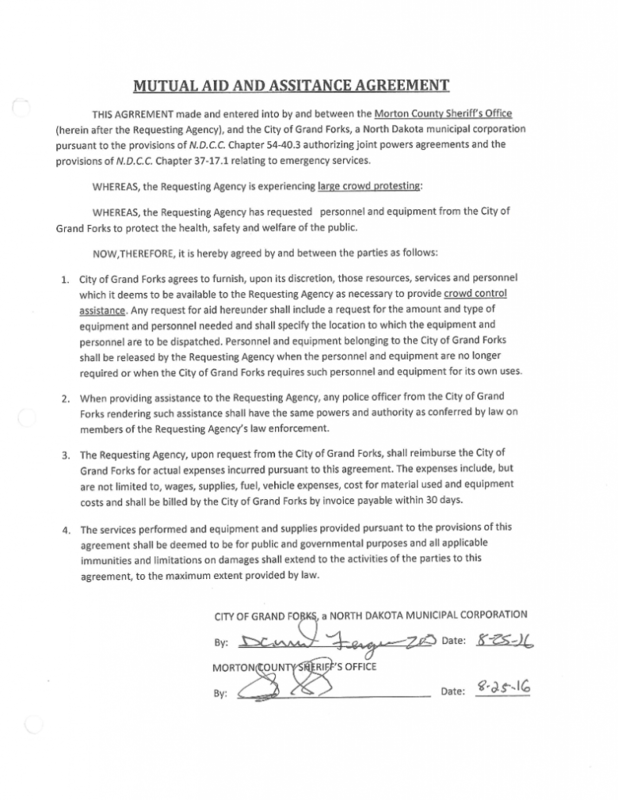 Here is an image of the agreement what we found between the City of Gran Forks and Morton county referencing North Dakota Commercial Codes chapters 54 and 37.
at (612) 348-3744 (he always seems busy). However we have had several conversations with Jon Collins a public information officer for the department at that same number. All he has been able to do so far is refer us to the Sheriff’s facebook page for current information on the North Dakota deployment. AND he requested we put our questions to him in email so they could be conveniently deleted (sarcastic satire), which we have done. Seems like many people in the Cities are not real pleased with that action. Thanks to City Pages and UnicornRiot.ninja for video we feature in this report. EXCERPT Clashes between law enforcement and protesters amounted to the most eventful day yet in the western North Dakota protest, which dates back to April. 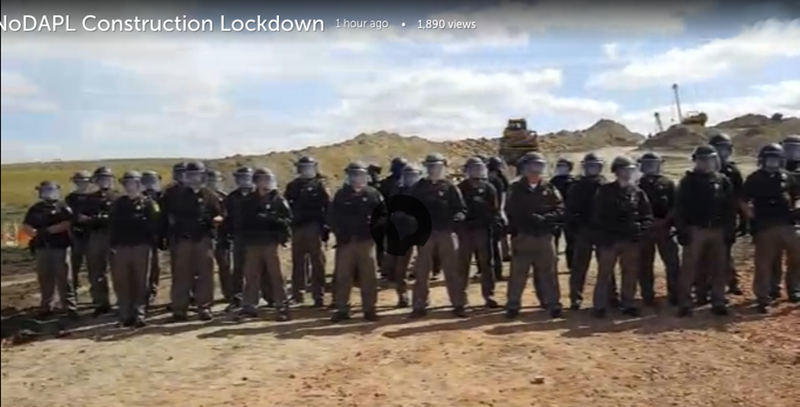 At least 141 protesters were arrested by night’s end, according to the Guardian (U.K.), though that number may climb: Morton County Sheriff Kyle Kirchmeier said still more activists were in custody, awaiting processing. 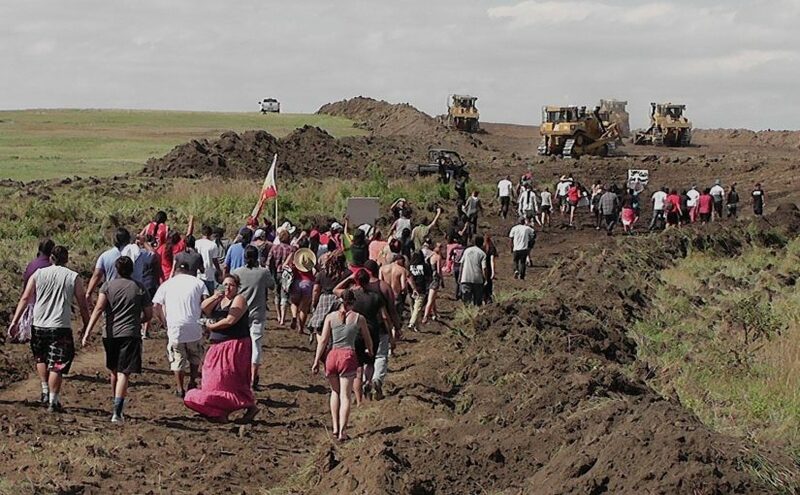 Cops say those protesters were arrested for damage to pipeline property and building illegal roadbloacks, and explained Thursday’s action as an eviction of the protesters from privately owned land. The thousands of Native American activists gathered there say that private land lies a little too close — about a half-mile — to the Standing Rock Indian Reservation, threatening that community’s water and disrespecting sacred sites. Thursday’s action by law enforcement pushed protesters off the ground where the pipeline would be built, and back into neighboring camps where many have been staying for months. The sheriff’s office in rural Morton County (population 27,471) has relied heavily on assistance from other agencies, including the National Guard and sheriff’s departments from other states, including three from Minnesota: Hennepin County, Anoka County, and Washington County. 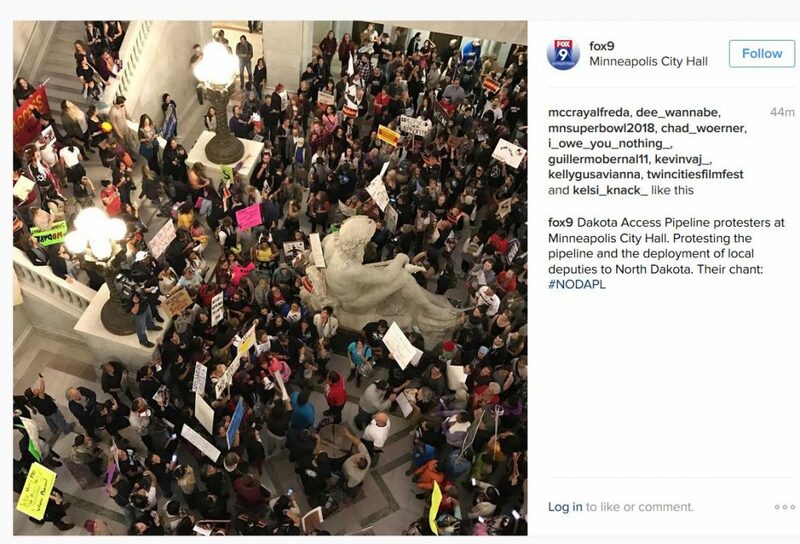 Those counties say they’re merely responding to a declaration of emergency by the North Dakota government, which is paying all costs related to the protest. 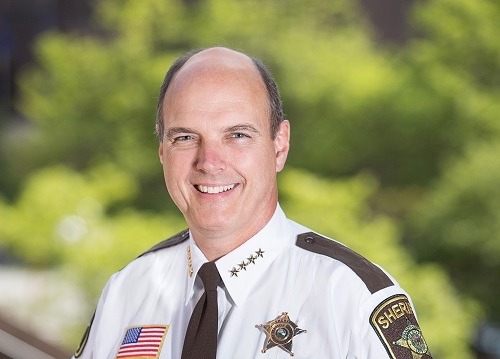 Hennepin County Sheriff Rich Stanek has been criticized by liberals in the county he represents, and earlier this week, hundreds marched on Minneapolis City Hall to oppose Stanek’s deputies traveling hundreds of miles to assist in fighting the protest. 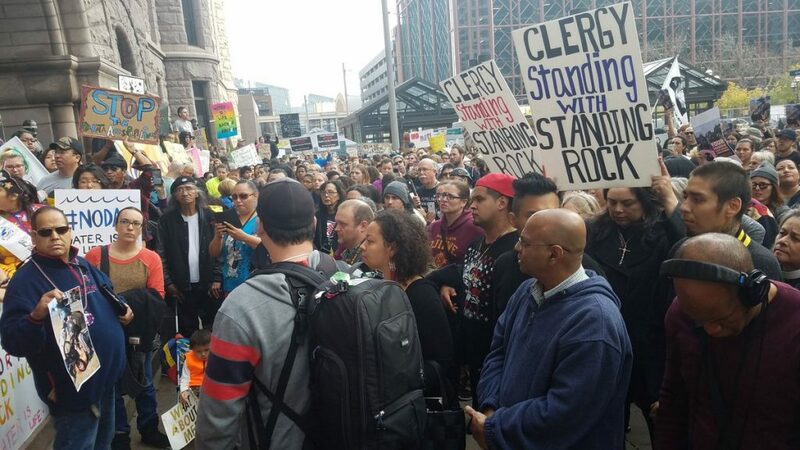 Stanek has said that he “respects the constitutional right of peaceful and lawful protest,” apparently a reference to the Minneapolis action, and not the one at Standing Rock. A video taken by embedded indie news organization Unicorn Riot on Thursday shows numerous Hennepin County deputies on the front lines of Thursday’s clashes, wielding batons and pepper spray to force protesters back.